One of the most intriguing observations we’ve had while traveling in Asia is the plethora of skin products on the market designed to make the user whiter. While in the West we’re spending millions of dollars to make our skin darker (from tanning salons to self tanners), in the East they’re spending a corresponding amount to go lighter. 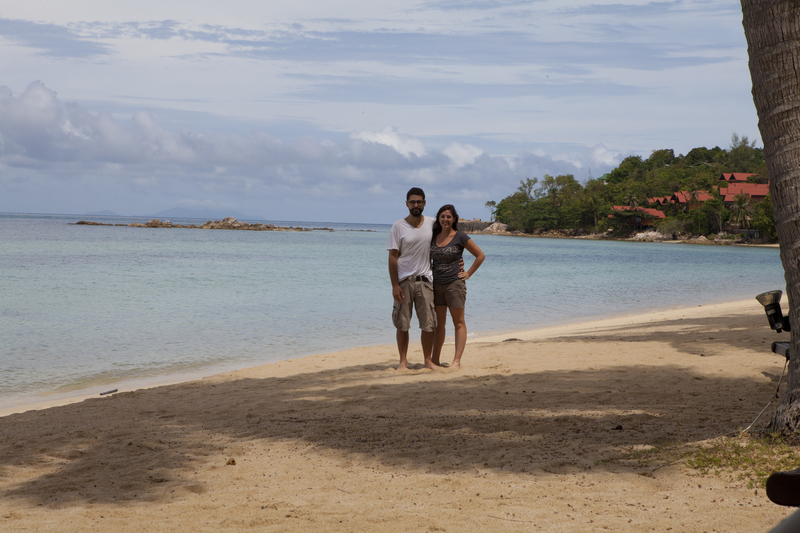 I spent the few days we had on the Thai island Koh Phagnan working to get my tan on. 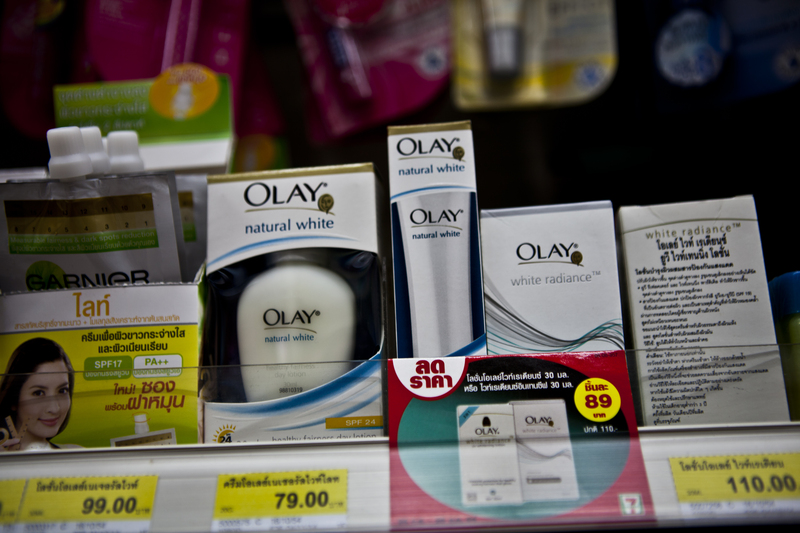 I scour the pharmacies for anti-wrinkle cream by my favorite brands including Olay, but all I can find are whitening products. They even have products for men. The TV commercials hawking these creams are an additional source of amusement with the women in them gazing approvingly in the mirror after a graphic explains this whitening lotion just made them 2 shades lighter. Will it ever be possible to abandon our world-wide obsession with skin color? Our preferences towards melanin levels clearly have more to do with the culture we’ve been born into than any degree of worth. Although to be fair, if I wasn’t so obsessed with getting a little color on my face, I probably wouldn’t need that all that anti-wrinkle cream either. 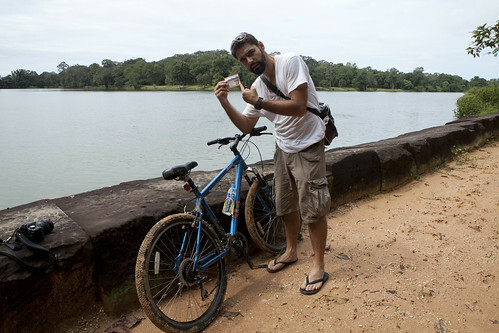 I clearly remember Molly asking me if I wanted to go through with the bicycle tour of Angkor Wat in light of the email from Markus Tigges (President of Khmer for Khmer Organization) warning us of the non-relenting floods. “What else are we going to do that day? ?” was my response. Needless to say the day was anything but boring. It took a while for the tour to get started in light of some “technical” issues: Molly’s bike had 2 flats and a broken chain. We were well on our way before I hit the next issue, namely a full body dip into a flooded Cambodia rice paddy with my camera strapped to me instead of being inside the bag. The rest of the day was quite the adventure bicycling about 40 kilometers through mud, waist-high water, monsoon rains and some amazing ancient structures. As you might expect the camera did not survive the trip to Cambodia, but the tour was definitely worth the effort and sacrifice. The photos that would have been captured would have told an amazing story, but it was not meant to be. 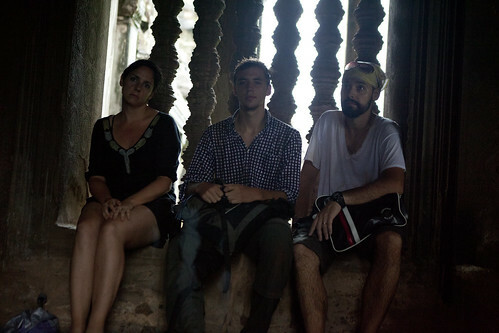 Instead we saw and experienced world heritage site in a unique way while contributing a donation for a good cause. It was a different way to celebrate my birthday, but in the end worthwhile. For awhile there it appeared we timed our arrival in countries to make sure we caught rainy season in full swing. September is monsoon season in India. We arrived in Delhi on September 1st. In Thailand, the wettest month of the year is October. We flew in on September 27th. We decided very early on that it would be impossible to avoid foul weather everywhere, especially with the wacky, pattern-challenging trends happening around the globe. But honestly, this was looking ridiculous. For most of our time in India, we only had rainy days in Delhi, which gave us an excuse to stay in and catch up on work. And we didn’t start to feel the impact of the wet season in Thailand until we tried to travel from Bangkok to Chiang Mai in the north via train. We arrived at the train station in Bangkok about an hour before our 6:30pm overnight train to Chiang Mai was to depart. Immediately, we were approached by a man who started trying to tell us something, but we abruptly brushed him off. Ha! Are you kidding me? We just left India. We’re not going to fall for a random man in the train station trying to derail our plans scam. But we didn’t get more than five feet before a woman walked to us and explained that all the trains to the north were canceled because of the floods. Floods? I may have seen something about it on the train website (which I guess I ignored.) We looked up at the TV stations in Hualampong Station and it was clear floods were a growing issue in Thailand. What were we going to do? After we got a refund on our train tickets, the woman in the station directed us to a tourist office which promptly got us on an overnight bus leaving that night. But I need to give you a little more information. We were warned about the overnight buses before coming to Thailand. A friend of a friend had taken an overnight bus on a very popular tourist route and woke up to find all of his money in his money belt gone. (A money belt is a wallet that many travelers wear underneath their clothes so you can imagine that it’s very difficult to get money out of the belt without waking the victim.) He discovered that many of his fellow bus riders were also robbed. The conclusion of this mystery is they were gassed into a deep sleep somewhere along the ride, allowing the bus driver and a team of cohorts to strip the tourists of their belongings. I did some research on this horror story and it apparently happened enough times to make the official warning list. So as you can imagine, the thought of taking an overnight bus was a little unsettling to us. I gave the woman at the tourist office the third degree as she prepared our new bus tickets and demanded that she ensure our bus was safe (like that would really help.) Nellu tried impress on me that none of this would do any good while the woman and a colleague showed me that it would be an official government bus. “See this symbol,” they said. There was a little water on the roads but nothing like we had seen on TV and when we reached Chiang Mai, any city we saw was flood free. It wasn’t until Cambodia that we really found ourselves in high water. We decided to fly from Laos to Cambodia to avoid possibly three days of travel and several tedious overland border crossings. The flight from Luang Prabang to Siem Reap was less than two hours and were were able to get a deal from Lao Airlines. (Yes that’s right folks – less than two hours by plane but three days via bus and train and tuk tuk). As we flew in over the city of Siem Reap, Cambodia, there was so much water on the ground, overflow from their great lake, I wondered where we would land. We had gone to Siem Reap to see the great temples in Angkor Park, the most famous being of course Angkor Wat. We booked an off-road bike tour that would take us over 40km to see the temples. 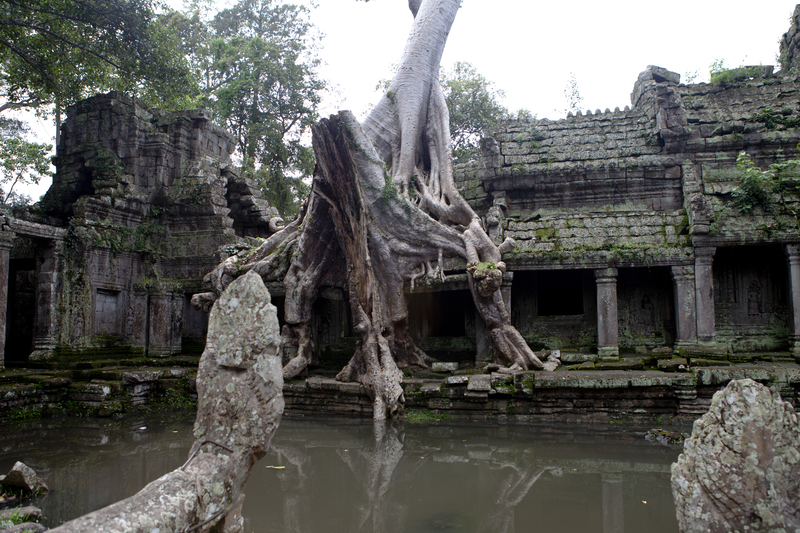 In the previous weeks, we had seen many reports of the floods so Nellu emailed days in advance to see if we could still go on the tour or if the temples were underwater. The area did sustain some flooding. Parts of our tour we’d have to deal with thicker mud and we might have to walk in water up to our knees. But we were tough, we told each other. We could handle it right? We would need plastic shoes though. Nellu only had his already incredibly beaten up Converse sneaks. And to me there was nothing like having to walk around in wet shoes. We checked into our guesthouse and immediately inquired where we might be able to buy some flip flops. Some of you who are reading this may be wondering why we don’t have flip flops. I have some leather sandals and a pair of trekking shoes that would have done the trick, but I left those with one of our big duffles back in Bangkok. (Remember, we were clueless to the floods). And Nellu has a personal no-open-toed shoe policy that he has maintained throughout the entire time I’ve known him. So we borrowed two of the guesthouse bikes and headed downtown. Unfortunately, the route we wanted to take was severely flooded. I went closer to get some video footage, trying in vain to keep my feet dry. It was clear that the locals had dealt with this problem before. There was a tractor to take people back and forth over a particularly deep intersection but for the most part people just walked right through the spots even if that meant being up to their waist in water. We finally found the old market and got two pairs of plastic shoes and headed home to prepare for our big ride the next day. Nellu is going fill you in on some of the gory details of our off-road bike trip but here’s a tease: both of us ended up in overfilled rice patties and I found myself at one point up to my knees in mud trying to rescue my new plastic shoe while the ground was working to suction it off. After Cambodia, we headed back to Bangkok for an overnight before taking off for the island Koh Phagnan off the eastern coast of the Thailand tail. On the six hour train ride from the Aranyaprathet/Poipet border towns, we witnessed more of the flooding on the Thai side. It was clear that vast areas had taken on much more water than the ground was ready to absorb. Back in Bangkok, we planned to stay with the same guesthouse we had during our first week in the city but we got an email from the owner that due to the floods threatening the city’s inner core he was closing shop. He found us a place to stay nearby and even brought over the bags we left in his storage room. 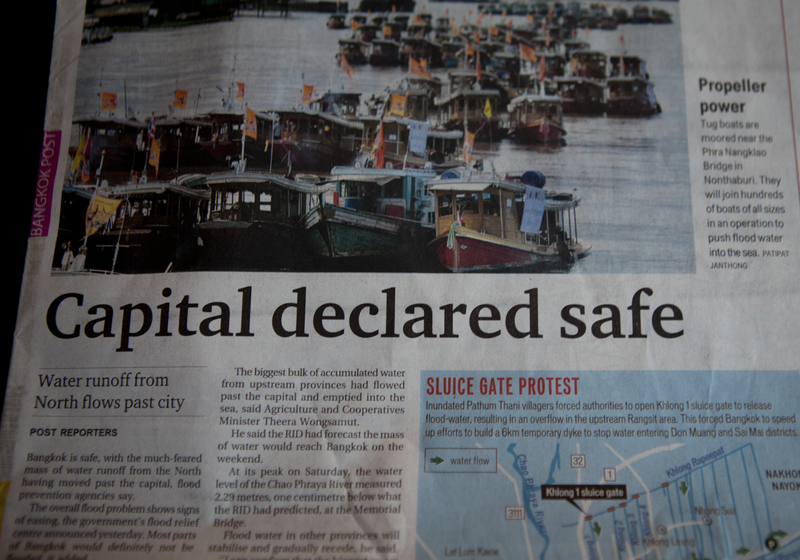 The morning we left for the beach, the Bangkok Post headline read, “Capital declared safe.” That declaration was clearly premature. The floods in Southeast Asia have caused more than 1000 deaths across the region. The impact of these high waters will be felt for sometime to come.